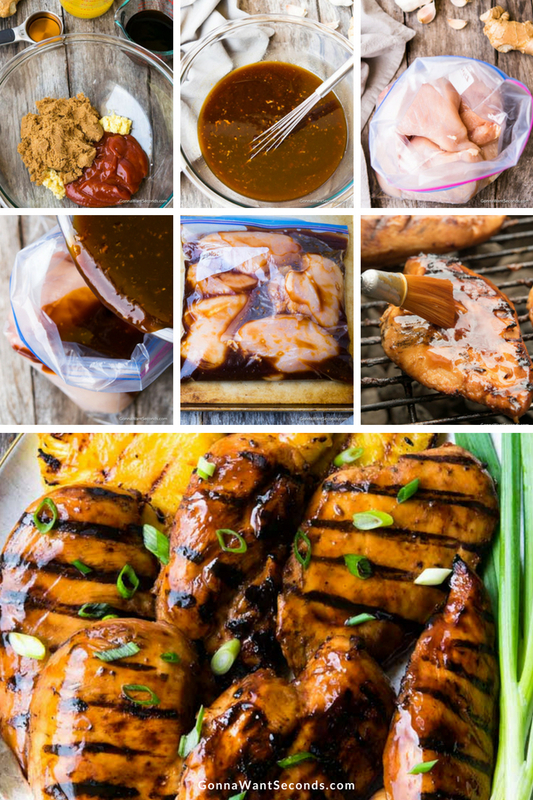 Our versatile and easy Huli Huli Chicken recipe is a delicious combination of Hawaiian inspired flavors of perfectly sweet, savory, and spicy marinade that will delight your taste buds and your dinner guests! Huli Huli Chicken is the food version of a beautiful tropical paradise. Amazing flavors combine to make up a mini vacation one bite at a time. Every single forkful of Huli Huli Chicken will whisk you away to a land of tiki torches and sandy beaches, where you sunbathe by day and hula dance your cares away by night. This may or may not be true, but in reality, my Huli Huli Chicken is a shining star of a recipe. Also, it’s so much fun to say. Serve this delish dish up with my Loaded Coconut Rice for a sweet surprise and very welcome mix in your supper time rotation. Huli Huli Chicken originated in Hawaii, with roots established deep into the culture. Traditionally grilled, it is not uncommon to place a mesquite wood block on the grill to enhance the intense flavors of Huli Huli Chicken. However, baked Huli Huli Chicken has risen substantially in popularity, as this method gives the chicken a chance to simmer in the huli huli sauce, creating a juicy and flavorful treat. Huli huli sauce is a delightful mingling of pineapple, soy, ginger, ketchup, cooking sherry and brown sugar. Anyone planning a tour of the Hawaiian Islands should research Huli Huli Chicken Maui and Huli Huli Chicken Oahu for a list of the best places (meet Mike) to get your hands on this tasty platter in its place of origin. 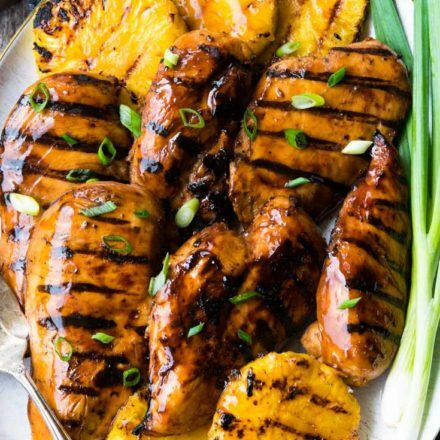 The marinade is quick and easy to make! Delivers Great flavor all the way through the chicken breast. Flavor combo is Spring and Summer-perfect. How do you make Huli Huli Chicken? I make my Huli Huli chicken on the grill. Simple and straightforward, I whisk together the marinade ingredients, saving one cup for basting. Then, I divide the rest of my huli huli marinade into two, one-gallon plastic bags, filling with two pounds of chicken each, and place in the fridge for 24 hours to marinate. Seems like a long time, but stick with it. Heat the grill to medium, oil the grates, grill it up! Huli Huli Chicken is a recipe that adapts very well to change. If you happen to have a meat smoker, smoked Huli Huli Chicken is delicious, as is Huli Huli Chicken rotisserie style. In a mixing bowl add brown sugar, ketchup, fresh ginger, and garlic. Whisk in soy sauce, pineapple juice, and sherry. RESERVE one cup of marinade. Place chicken in a 1-gallon sealable plastic bag. Grill, basting using the reserved marinade to baste. What do you serve with Huli Huli Chicken? Ah, the question that has plagued generations: How do I know what to serve with Huli Huli Chicken? The Huli Huli chicken Guy Fieri serves up comes with just a side of delicious huli huli sauce. While I am a true believer in unlimited huli huli sauce, I like to have a heartier side when I’m dishing out Huli Huli Chicken. You can’t go wrong with my Authentic Hawaiian Macaroni Salad to tie in the theme and bring your meal together. In a pinch, white or brown rice will do the trick. Hawaiian recipes are so fun and flavorful. 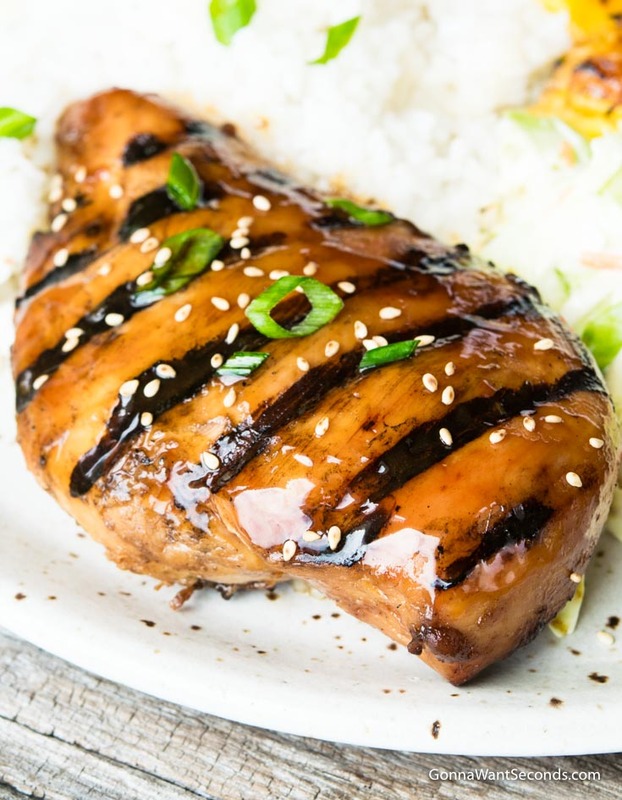 If you love this one, I have to recommend this fantastic recipe for Easy Shoyu Chicken. 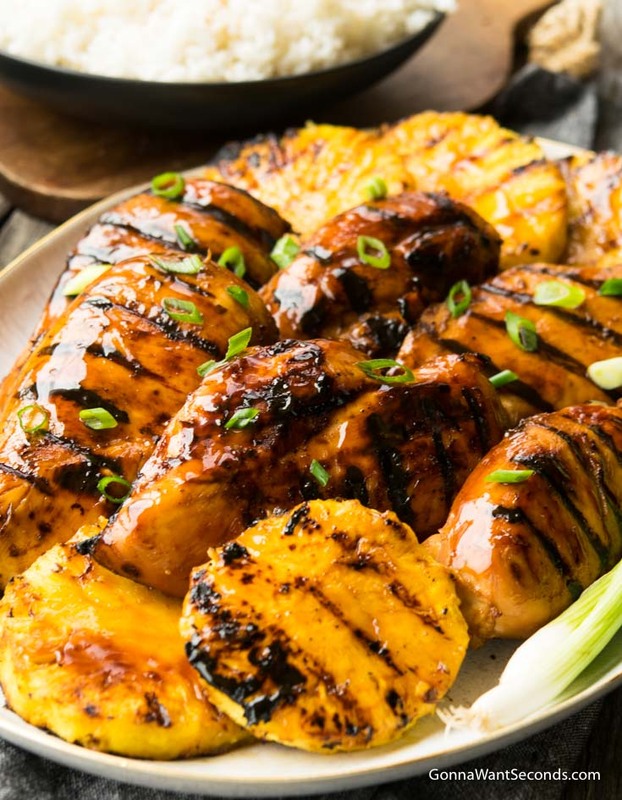 Fun to make and perfect for summer, these Hawaiian creations will have you well on your way to throwing the best Luau in town. In a medium mixing bowl, add dark brown sugar, ketchup, pineapple juice, fresh ginger, and garlic. Whisk in soy sauce, pineapple juice, and sherry until well combined and brown sugar is dissolved. Remove and reserve 1 cup of the marinade. Cover with plastic wrap and refrigerate until ready to grill the chicken. This will be your basting sauce. 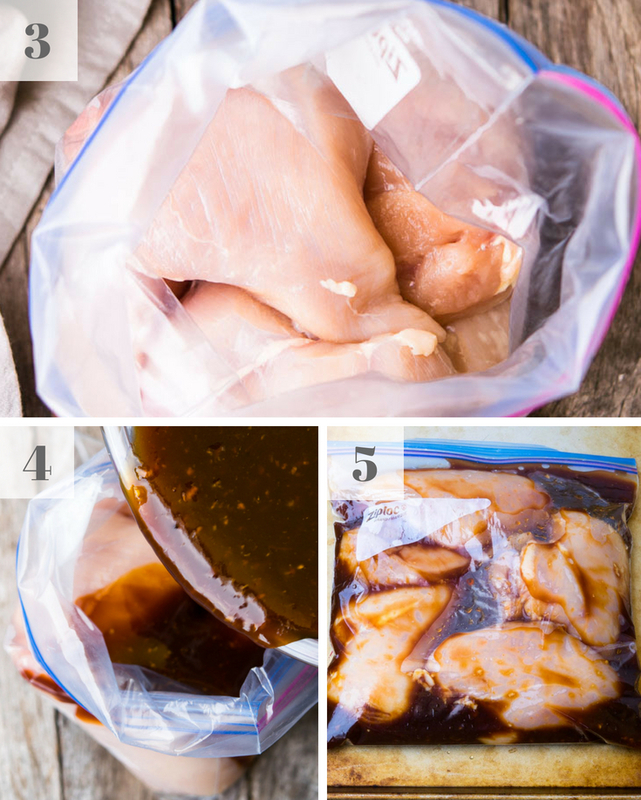 Remove chicken from marinade and discard marinade in plastic bags. For Chicken Boneless Thighs: Grill about 5-8 minutes per side, basting each side before flipping with reserved marinade, or until an instant-read thermometer reads 165 degrees. For Chicken Boneless Breast: Grill about 4-6 minutes per side, basting each side before flipping with reserved marinade, or until an instant-read thermometer reads 165 degrees. General– Whichever cut of meat you select remember, your grilling time will vary based on the exact temperature your grill is cooking at, the distance your grates are from the heat, and the size and thickness of the pieces of meat you use. Chicken Thighs– Small chicken thighs generally grill up in 10 minutes overall and larger thighs grill up in about 12 minutes overall or until an instant-read thermometer register 165 degrees. Chicken Breasts: boneless chicken breast is one of the easiest pieces of meat to overcook so take care! 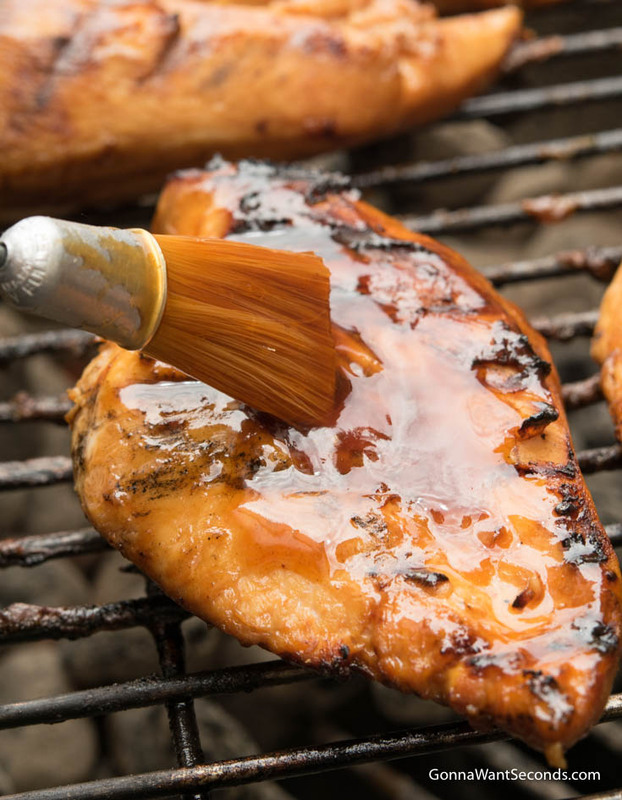 Sauce: The sauce is thick and delicious and coats the chicken perfectly as it grills. Remember to remove and reserve, per the recipe, 1 cup of the marinade to use as a basting sauce when grilling. 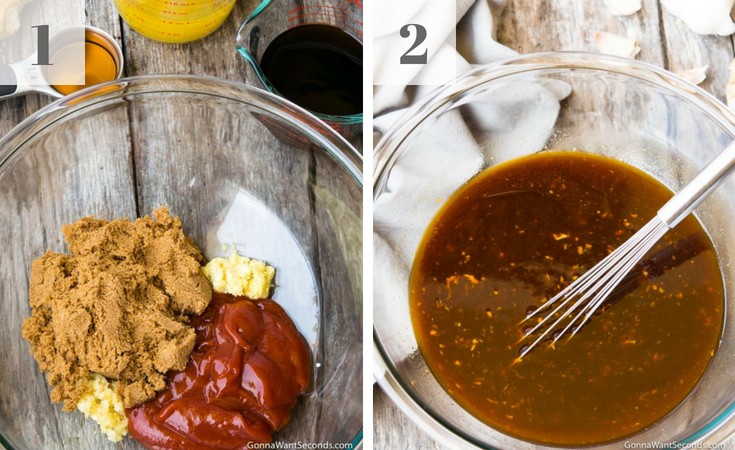 Marinade: It’s quick and easy and only needs/uses a few ingredients and the flavor! 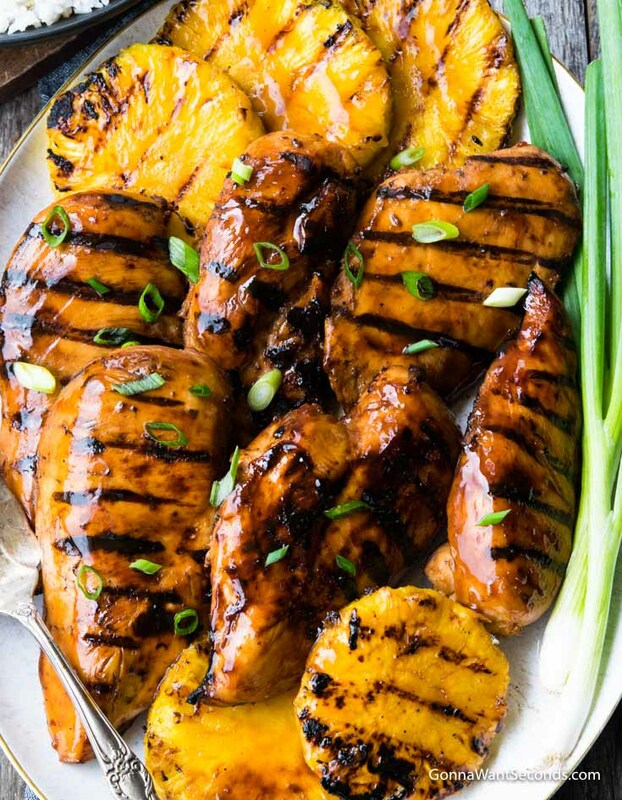 Marinade for 24 hours so that all the delicious flavors can deeply permeate the chicken pieces and the chicken can really soak up all that delicious flavor. Reserve some of the sauce to baste the chicken with while it grills. Soy Sauce: I like a Hawaiian style, sweet, low sodium style soy sauce for this recipe like I use in my Shoyu chicken. Swap the Ketchup: If you’re looking for a smokey variation of this recipe, consider swapping out the ketchup with some prepared BBQ sauce. It will also change the flavor profile slightly, adding a little smokey hickory flavor as well as a little more sweetness, and be a nice variation in your dinner rotation. How do you make Huli Huli Chicken in the crockpot? There is not a thing on Earth that can come between me and my slow cooker. These simple guidelines for Huli Huli Chicken slow cooker style will have you ready to rock in 6-8 hours (on low). How do you make Huli Huli Chicken on the stovetop? Huli Huli Chicken is a sure-fire hit for gatherings large or small. For those of you who are planning to Google “huli” because you’re dying to know what the heck it means, let me save you a search. It means “turn around” in Hawaiian. Enjoy! 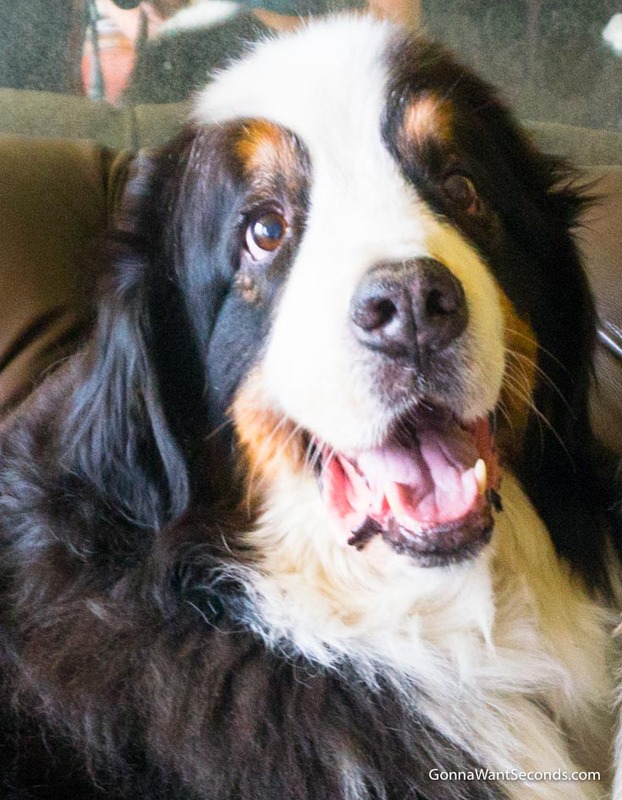 Sweet Bruno Hangin on the Sofa!